The 2011 St. Louis Cardinals were admittedly built around their offense. The trade of Brendan Ryan coupled with the acquisition of Ryan Theriot meant a defensive sacrifice at one of the toughest spots in the field. Combining this with Skip Schumaker at second and the rather limited range of the outfield, the team surrendered 84 unearned runs, the most in the majors. The pitching staff, initially, was thought to be somewhat of an asset, if not overly a huge strength. The tandem of Chris Carpenter and Adam Wainwright would be generally considered one of the strongest 1-2 combinations in the majors. As Murphy’s Law gleefully points out, that wasn’t the case. You gotta admit, Carpenter’s been a horse on the mound when he’s been healthy. Each of the last two seasons, he’s led the major leagues in games started, and last year, he also led the majors in batters faced and led the NL in innings pitched. The first half of 2011 was a pretty rough one for Carpenter. As of June 17, he was 1-7 with an ERA of 4.47. After that, though, something clicked in his head, and he became the Chris Carpenter we’re accustomed to seeing, going 10-2 the rest of the way with a 2.73 ERA. In the playoffs, Carpenter further cemented his legacy as one of the greatest Cardinals pitchers of all time when he set the team record for most post-season wins (it should be noted the previous record-holder, Bob Gibson, only pitched in the World Series due to the structure of the league at the time). Although he had a couple off-games, he will be noted for two games in particular: game 5 of the NLDS, in which he outdueled Roy Halladay for nine innings in what is certainly one of the top pitching duels in playoff history, and game 7 of the World Series, when he pitched into the seventh inning on three days’ rest and earned the win in the clincher. 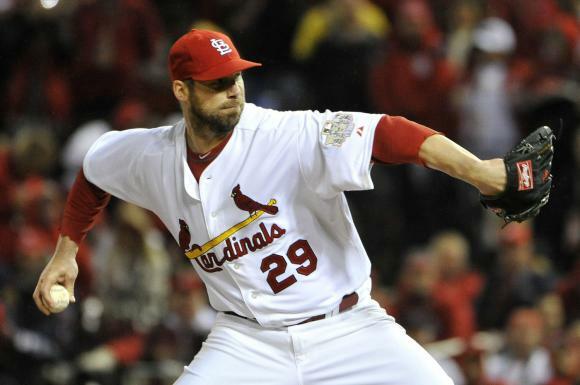 As an unforeseen consequence of the playoff run, however, Carpenter threw a total of 273.1 innings. Back when teams had four-man rotations, this wasn’t generally a big deal. Nowadays, especially for a pitcher who turns 37 in April and has had two surgeries on his throwing arm, it could be pretty significant. The Cardinals have already announced they will abbreviate his pitching schedule in spring training, and possibly beyond, in order to accommodate his arm. Carpenter signed a new two-year deal in the off-season, likely making the Cardinals the final team of his career. As much as I hate to admit it, I called Waino’s injury. I certainly would have been glad to be wrong, but last winter my buddy Nick and I were talking baseball, as some who know us know we are prone to do, and I mentioned Wainwright’s throwing motion as being a potential red flag, coupled with a previous elbow injury he’d had. Sure enough, in mid-February, I remember reading online as soon as it happened that Wainwright had to leave a throwing session and getting a sinking feeling in my stomach. As soon as it was announced Wainwright would undergo Tommy John surgery, the season got a lot darker. There’s little question that even with Carpenter on the team, Wainwright had been the ace of the staff the last couple of seasons. In a two-year span, he’d gone 39-19 with a 2.53 ERA, 1.131 WHIP, and 3.48 K/BB ratio. As we all know, the Cardinals managed to survive without him for the season, but I’d rather not go through that again anytime soon. The question for this season is how well he’ll recover his command and how many innings he’ll log. The long-term question is whether or not his throwing motion did in fact have to do with his injury; if so, will he change his wind-up enough to prevent further injury and still be successful? By all accounts, he’s throwing hard and able to snap off his curveball as effectively as before the surgery. Here’s hoping for a full season of health from him. 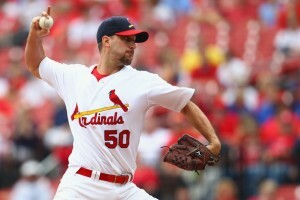 The Cardinals picked up his option for 2012 and 2013, after which he’ll become a free agent. When he’s healthy, he’s one of the dominant starting pitchers in the league. This is, unfortunately, the second major injury he’s suffered in the last four years (he suffered a finger injury in 2008 that forced him to miss more than two months), so one has to wonder whether durability will become an issue. Obviously this is the guy everyone’s drooling over, and for good reason. Miller was the Cardinals’ number one pick in 2009. After a promising 2010 spent at low-A ball, he moved up to high-A and AA in 2011 and did nothing to dampen the excitement. At high-A, he threw the ball past everyone, striking out an average of 13.8 hitters per 9 innings. Promoted to a notorious hitters’ league, he actually lowered his ERA. His K/BB ratio dropped a little, as he faced more experienced hitters, but he still went 10-3 and struck out 9.2 hitters per 9 innings. Miller has a fastball that reaches 97-98 MPH and has an above-average curveball. His tertiary pitch, a changeup, is still developing. Miller’s got an invite to spring training, but he’ll likely start the season off at Memphis. He could be called up as early as this summer, or perhaps in September when the rosters are expanded. If everything goes as planned, he should be in the majors by next season.